Professional protesters from various Leftist organizations held a Black Lives Matter protest last night in Durham. When not a lot of tweeting goes on during one of these protests, it’s usually a sign of under-attendance. Local media doesn’t seem to have any coverage of it, not even the Herald Sun. From the scant few photos/video seen on Twitter, it looks like maybe a hundred people showed up. Like I said, there weren’t a ton of tweets to grab and there was no coordinated hashtag. There was a mix of the tags #TamirRice, #SandraBland, #Durham, and #BlackLivesMatter. Occupy Chapel Hill’s former leader tried to make it seem like something was going on. But the reality was a bunch of folks walking and chanting. Not sure what the whole shemagh is about in this one. Trying to look like some kind of tough militant are we? So they protested for Tamir Rice and Sandra Bland. They complained about black kids ‘not being treated as human’, yet I don’t see them marching for Maleah Williams, the one year old Chapel Hill child shot and killed in a drive-by by 22-year-old Shaquille Oneill Davis. “Our kids is getting killed and it’s all because of guns,” said Clarence Freeman, a family friend. “Will it ever stop? We talk about black on black lives matter. It can’t matter if we start killing each other. How can black on black lives matter when we start pulling the trigger on our brothers and our children? Especially our children. Good question. Well, it’s clear that Maleah doesn’t fit the Black Lives Matter narrative. 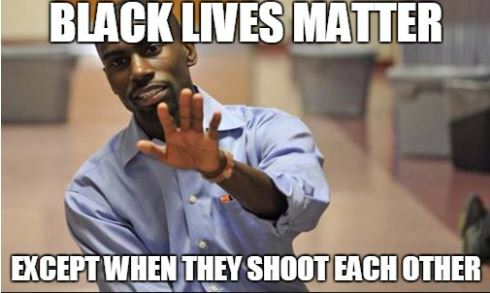 Black Lives Matter is only concerned with police shooting black people, not black folks shooting each other. It’s break-out moment was based on a lie (‘Hands up, Don’t shoot’), which allies in the media then perpetuated. Given their start, perhaps Black Lies Matter is a more apt title for such a movement. The same can be said for the movement’s ‘leaders’. Deray McKesson is an opportunistic and professional agitator with an appetite for fame and zero tolerance for anyone calling him out. Shawn King is a white guy pretending to be black. King also has followers questioning where all the money they’ve donated to ’causes’ King manages has gone. The math just isn’t there to support any of their wild claims of police out of control. Sure, there are some officers out there who are probably abusive and where deadly force was used by not necessary. But the narrative that all police are evil and have to go isn’t just lunacy, it’s demonstrably false. Looking at the recent available crime statistics (2013), we find that there were 6,261 black homicide victims. Over 6,000 of them were killed by other people and not the police. That’s around 97%, for those doing the math. The remaining 3% were related to the commission of a violent crime and the suspect was armed. NY Post has an article dealing with 2009-2012 statistics, which also show Black Lives Matter claims to be wholly wrong. This entry was posted in BlackLivesMatter, LL1885, Poltical Correctness, Racial Justice, The Articles, THE LEFT and tagged Black Lives Matter, Durham, Maleah Williams, Zaina Alsous. Bookmark the permalink.